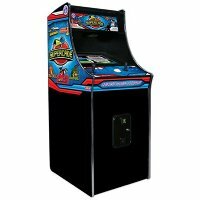 CHICAGO GAMING - SuperCade is an unprecedented value for the home game room enthusiast, featuring a full sized arcade cabinet, arcade controls and 19” VGA monitor. Chicago Gaming Company has been manufacturing arcade games for over 30 years. We deliver incomparable quality that has withstood the test of time. Coin-door has been permanently deactivated, SuperCade is for home use only. Commercial use is prohibited. Specifications subject to change without notice. Game Dimensions: 24"W x 30"D x 63"H; 240 lbs. Shipping Dimensions: 28"W x 34"D x 68"H, 265lbs.